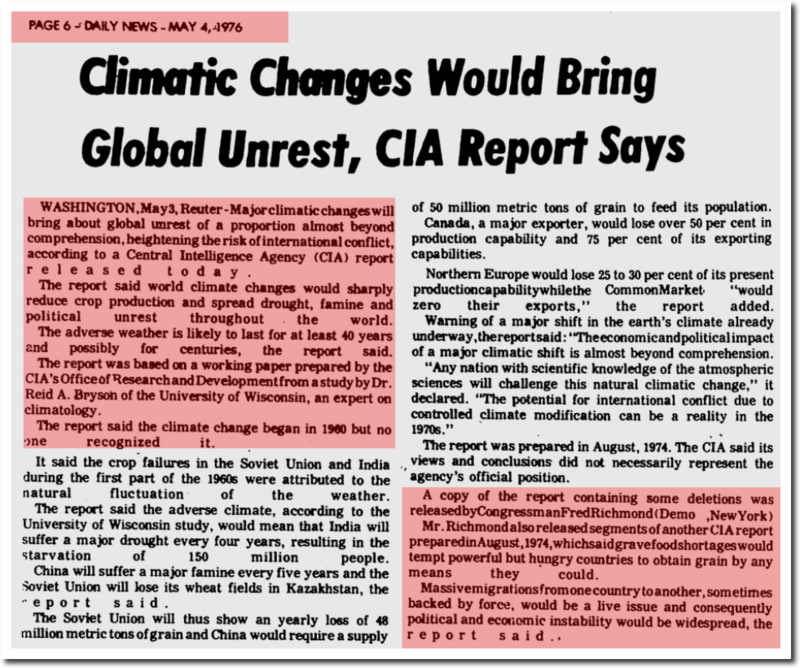 In 1974, the CIA said global cooling would produce drought, famine, international conflict and political unrest throughout the world. The Military Industrial Complex now says global warming will produce drought, famine, international conflict and political unrest throughout the world. 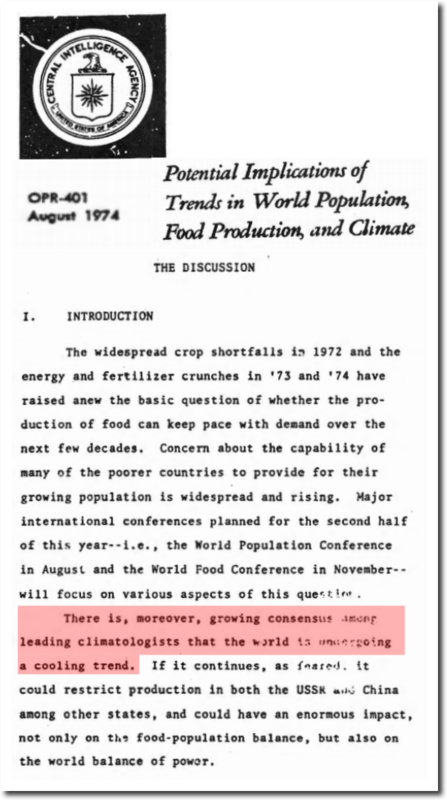 Non-existant global cooling caused quite a stir in the 1970’s, even if today’s leading climate experts now deny that it ever happened. It never could have happened because climate models clearly indicate that there is no way that temperatures can ever go down while CO2 goes up. The 1970’s cooling was obviously fake news produced by the Koch brothers and the evil fossil fuel industry. I see President Trump is causing “unrest beyond comprehension” for a whole lot of Global leftist far beyond what the cooling scare did. Looks like he’s going to drop the Paris “agreement” ! Yes, and if you don’t believe these reports you are “anti-science”, and should be locked up. Back in 1973 when I was in third grade, my teacher told the class that a new ice age was coming. She didn’t say it alarmingly, she was just informing us. I remember having the reaction, “Huh, I wonder what that will be like.” Since the late ’80s I’ve been hearing that global warming is going to destroy the earth. I’ve been as worried about that as I was about the looming ice age. Technically, we are in an Ice Age right now, for large areas of Earth have perennial ice cover. Thus, an interstadial or interglacial era versus a full on stadial or glacial era, the last such stadial ended about 12,000 years ago, estimated.